184 pages | 4 B/W Illus. In what ways can the powerful dictate the identities of the powerless? How can the powerless redefine their identity to challenge the powerful? Each chapter is written by leading authorities in the field, and investigates a particular aspect of the interplay of identity and power via a range of empirical contexts such as colonialism, nationalism, collective action, and electoral politics. The case studies include early modern Goa under Portuguese rule, the tribes of modern-day Jordan, the use of sexual stereotyping and objectification by female activists seeking to transform social systems, and a revisiting of the classic Stanford Prison Experiment. The chapters include contributions from a variety of social disciplines and research methodologies, and together provide a comprehensive overview of a subject at the cutting-edge of social and political psychology. 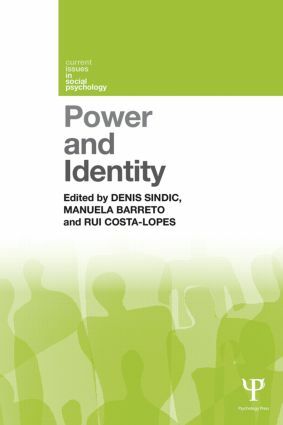 Power and Identity will be of great interest to researchers, graduates and upper-level undergraduate students from across the social sciences. Denis Sindic is Research Fellow at the Institute of Social Sciences, University of Lisbon, Portugal. Manuela Barreto is Professor of Social and Organizational Psychology at the University of Exeter, UK. Rui Costa-Lopes is Postdoctoral Research Fellow at the Institute of Social Sciences, University of Lisbon, Portugal.